We eat a lot of chicken and so I hear from Mathlete “chicken, again?” a lot too. I definitely have to try and make it interesting so that he doesn’t get too tired of my favorite protein. Well, to be honest, my favorite protein is probably bacon but we’ll pretend it is chicken since that is a little healthier. I recently made orange chicken with a white bean saute and it was a huge hit! This dish was inspired by a Buzzfeed lunch recipe that I saw a few weeks ago. 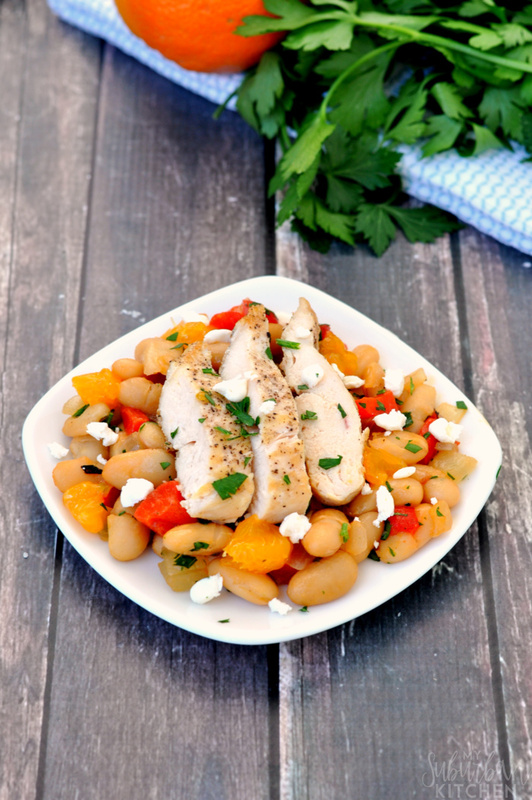 With grilling season coming up, this white bean saute would be the perfect thing to serve with some delicious grilled chicken! I pan roasted it the last time we had it and it was so good. 1. Combine 1/2 reserved orange juice and chicken breast in a bowl. Marinate for 15 minutes. Remove chicken from marinade and season with salt and pepper. 2. Heat 1 Tbsp oil in skillet over medium-high heat. Add chicken and cook for 5 minutes on each side or until cooked through. Remove from pan and keep warm. 3. Add 1 Tbsp oil to skillet. Add onion and cook for 3-5 minutes or until softened. Add garlic and cook for an additional 2 minutes. Add red peppers and beans. Cook for 5 minutes or until heated through. Remove from heat and add parsley, oranges and goat cheese. 4. Whisk together remaining orange juice and apple cider vinegar. Add to white beans. 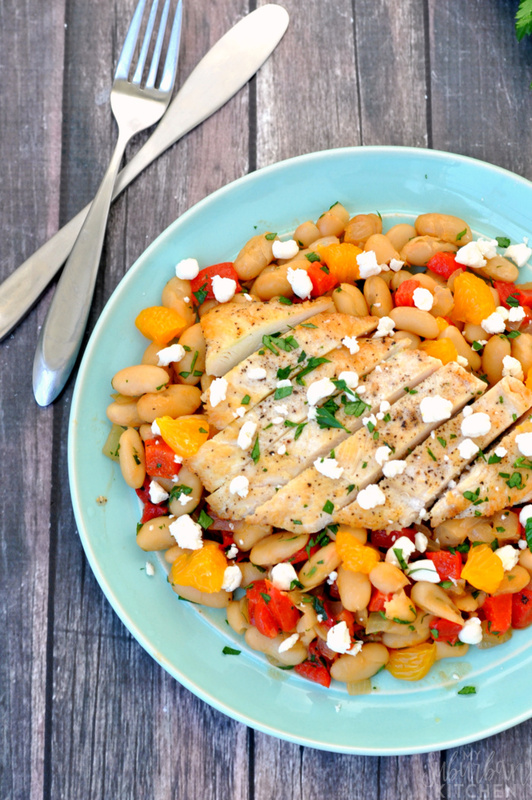 Serve white beans with chicken. This dish comes together so easily and uses only one pan so I love making it for dinner! It reheats great too so it is perfect for leftovers. I usually make a little extra to make sure Mathlete and I both have lunch for the next day. Combine 1/2 reserved orange juice and chicken breast in a bowl. Marinate for 15 minutes. Remove chicken from marinade and season with salt and pepper. Heat 1 Tbsp oil in skillet over medium-high heat. Add chicken and cook for 5 minutes on each side or until cooked through. Remove from pan and keep warm. Add 1 Tbsp oil to skillet. Add onion and cook for 3-5 minutes or until softened. Add garlic and cook for an additional 2 minutes. Add red peppers and beans. Cook for 5 minutes or until heated through. Remove from heat and add parsley, oranges and goat cheese. Whisk together remaining orange juice and apple cider vinegar. Add to white beans. 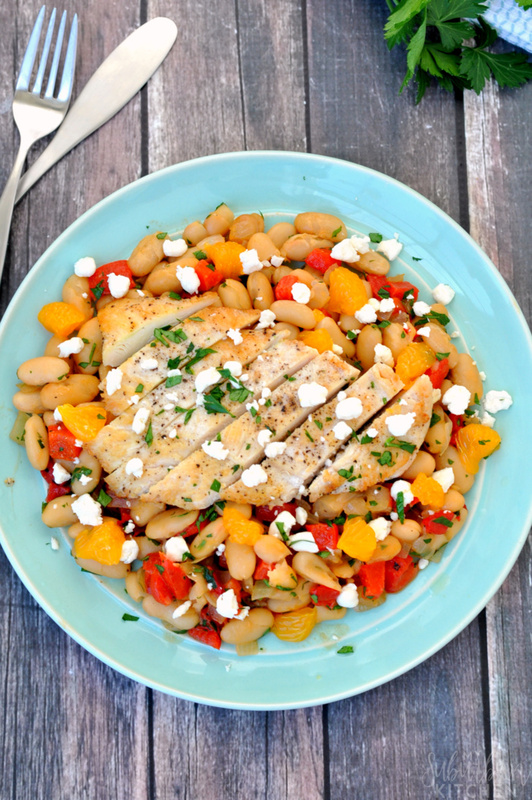 Serve white beans with chicken. This looks delicious! Love the use of mandarin oranges! Your beautiful photos sold this dish! They are gorgeous and I definitely want to try this meal now 🙂 Thanks for the new recipe! Thank you so much! You will love this recipe for sure. Yum! Chicken is definitely a staple around here as well, and to be honest it’s my favorite protein too (and to be really really honest, I feel the same way about bacon as my fav protein as well), but it can get pretty boring. That’s why I love this recipe! It’s something I haven’t heard of, and something I’m definitely willing to try. Thanks so much for sharing this with us on #shinebloghop, Shannah! O yum! I’m guessing the goat cheese steals the show! Thanks for linking up with us at Throwback Thursday! Have a great Memorial Day Weekend! My daughter is the same way. We eat a lot of chicken. Always great to find new recipes. Thanks for sharing at the Inspiration Spotlight party. Pinned & shared.